Description: When we open our homes to hospitality, how do our day-to-day lives change? Jen Schmidt is the popular lifestyle blogger behind Balancing Beauty and Bedlam, and she’s the author of the brand-new book Just Open the Door: How One Invitation Can Change a Generation. Jen is Kristin’s kindred spirit, and today they trade tidbits of wisdom about shepherding guests into their homes. And stay tuned to the very end of the episode, where Jen reveals her favorite ways to get folks to the table (hint: brunch is involved). I’ve met a dear kindred spirit. Listen to the episode, you’ll see what I mean. Jen Schmidt is busy. She’s a motivational speaker, worship leader, and writer. She’s the blogger behind the popular lifestyle site Balancing Beauty and Bedlam. Now she’s the author of the brand-new book Just Open the Door: How One Invitation Can Change a Generation. If that weren’t enough, she’s a wife and a mom to five kids. Yet Jen finds time for hospitality—and a lot of it. 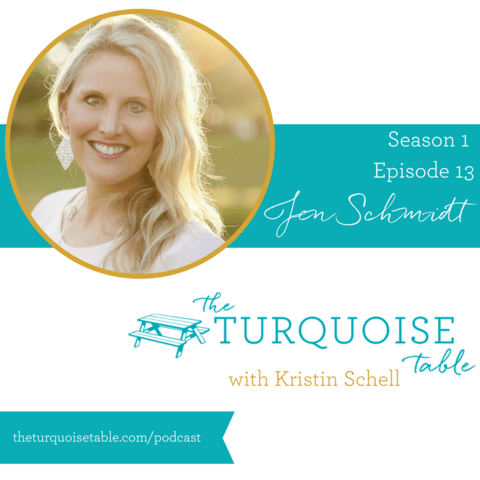 As a fellow hospitality enthusiast, I was so thrilled to have Jen on the show today. I love swapping all kinds of hospitality hacks and stories. That’s one of the best parts of this community: we get to learn from each other (and laugh at our blunders along the way).